Great photos of the harlequin bugs, but I’m sorry you seem to have so many. I hope your soapy water solution helps. I occasionally mix up something similar, especially for when our aphids run amok in the greenhouse where the predatory syrphid flies can’t reach them. I don’t know if it would make a difference, as your strong soap solution might be enough, but when I make a weaker soap solution for other garden beasties, I often put a little oil (vegetable or olive oil) in the solution to help it adhere to the plant (and the bugs) better, so it doesn’t evaporate off so quickly. It seems to help to smother them. Hello Clare 🙂 Thanks for the suggestion; I might try adding a drop of oil. 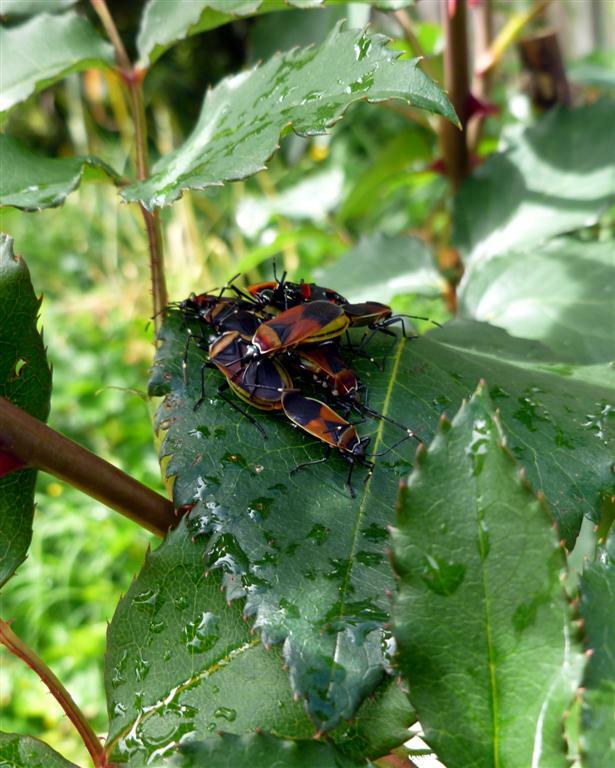 Hi Shyrlene, I just looked up the Boxelder bugs – wow – you can see these two bugs are related can’t you?! I agree, they do look kind of creepy, as are the harlequin bugs…I think it’s the way they like to cluster together that makes my skin crawl a bit. But I do like the name ‘Zug’ though! thanks for the warning – I have seen them in my garden only occasionally, but from now on I will be merciless. I love posts like these, I do want to learn about insects and am very ignorant. The worst insect I ever tangled with were weevils, I forget the exact name. I called them evil weevils and they were. Hi Catmint and thanks for the lovely feedback 🙂 I know bug posts aren’t everyone’s cup off tea, but I find them fascinating! With any luck you’ll continue to only make an occasional sighting of these little horrors. Some years I have a few and some lots, sadly this is a ‘lots’ year! The thought of ‘evil weevils’ in the garden made me laugh, I’ll have to look out for those! Hey there, how do the plants handle the soap spray in the heat? Hi Jess, good point – I do need to be careful with it. I find if I use the soap and water without any oil added it is not such a problem, as it mostly evaporates before it can cause a problem, but I avoid spraying until evening on hot days. It’s also one of the reasons I prefer to use the ‘pick off and drop in the bucket’ method, even though catching the bugs with my hands is not really my idea of a good time! Just had a blog visitor via your last year’s post on these bugs. Curiously I’ve never seen so many again, as when I blogged about them. Not a problem in my garden as I’m still not growing food crops. The Melianthus doesn’t get cut down by frost, so I’ve taken to pruning it hard. The autumn rain should trigger lots of fresh shoots, and perhaps a few bugs. Hi, I have found these evil bugs destroying my raspberry crop. Ihave the erfect spot and the palnts weere absolutely flourishing and producing almost a handful of fruit every two days……. until the evil bugs invaded! ow I have destroyed fruit and bugs everywhere. I first sprayed with pyrethrum which worked for a couple of days (I thought) then I got really mad and sprayed with confidor (given the expert advise of my local garden shop)this definitely works IF you can manage to spray every single bug but you cannot eat the fruit for 3 weeks and after only 1 week I have more bugs than ever and am STILL throwing away my fruit. I am about to try the dishwashing liquid, oil and water mixture, I really hope this works as I am so disappointed at losing my amazing crop of fruit. Has anyone else had these bugs n raspberries? and did anything else work? I would reallu love to eat some of my crop this year!!! Hello Judy and sorry about the lateness of my response! The diswashing liquid does work, but you have to be pretty relentless in spot checking, as if you miss any bugs they will start breeding again. You are better off drowning them in a bucket of the mix than spraying with it and persistence will eventually tame the population. This year I had grapevine hoppers in my raspberries rather than harlequins. Pretty devestating damage there too. Again the soap mix works, but because it is not a poison (which is my preference as I don’t want to take out the ‘good bugs’ in the crossfire) you have to be prepared to check every day or two. Hi Trish, It is quite possible that you are looking at the young of exactly the same bug. They start of as tiny red bugs.Keep and eye on them and if you see that they start developing black markings and are beginning to look more like the bugs in my third photo I’d say they are one and the same! They do like roses, particularly sucking the life out of tender new stems 😦 Flick them off into a bucket of the soapy mix, it’s more effective than spraying! Hi Folks I have noticed them here in Bendigo this year in big numbers, I am not sure of the tree that we have in our back yard,it has lots of small yellow flowers on it at the moment. Hi, I’ve just finished cleaning these bugs out of my lounge room. Finally came across your blog. I had literally hundreds of them. I filled our bagless vacuum. the got un the house via our air conditioner. We’re next door to a Vic Uni Gardening Hub in Seddon. They have fruit trees a long the fence line. This year they didn’t pick any of the fruit or prune any of the trees. These bugs loved it. Their is now plague proportions of them. Obivously in and around the house I didn’t have to be so careful with destroying plants. But these bugs are tough. I’ve used Mortein outdoor barrier spray. Unless you spray them directly with this it’s a little ineffective. I’ve bought crawling insect indoor spray and this works well when sprayed directly. While they dislike Eucalyptus oil it isn’t as effective barrier as it is for other insects. I don’t know why they’ve come into the house. My theory is because it was a hot day today. If they come back like they were today I think I’ll have a mental breakdown. I pulled the whole lounge room apart and was at it for hours. Sorry to hear about that Adam – I’ve not had them in the house! Is it worth talking to the people who manage the garden at VU? Managing the bugs organically might be a good learning experience for their students and if there is lots of of unattended ripening fruit around again next year, I’d imagine you will have these little horrors back again. I’ve wondered if a moist/ humid environment is a deterrent as in the cooler months the bugs ‘hibernate’. Last year I gave up on the garden (as it was decimated) and therefore didn’t water as much. When I checked in with my neighbours who were watering a lot, I found the numbers of bugs present to be much lower. Do they prefer a dry/ dryer micro climate?? Hmmm…interesting question Rusty! I’m no expert, I only know what I see in my garden. But what I’ve seen is that while they don’t like the cold, they do seem to like juicy new stems. So my experience has been that more I water the more bugs I get. But it could be different in your area. Unless you’ve just happened to plant lots of the plants they love the most! I have these bugs in my garden at the moment. Could you kindly advise the mixing ratio for the dishwashing, oil and water mix. Also can I spray this mix directly onto tomatoe plants? No oil needed for this one Dean. Just water and cheap dish-washing detergent, but quite a bit of detergent, maybe about 20 to 25% The aim is to block the bug’s breathing tubes. Brutal but simple. I would suggest checking the label of the detergent you use to make sure there is no nasties in it, but I use an environmentally friendly brand that leaves no residue that would be harmful to the garden. Spraying directly on to tomato plants is fine, but I would avoid spraying on the fruit, particularly if it is sunny/hot as the detergent can make it adhere a bit. Might be better to try flicking the bugs off in to a small bucket of the solution. 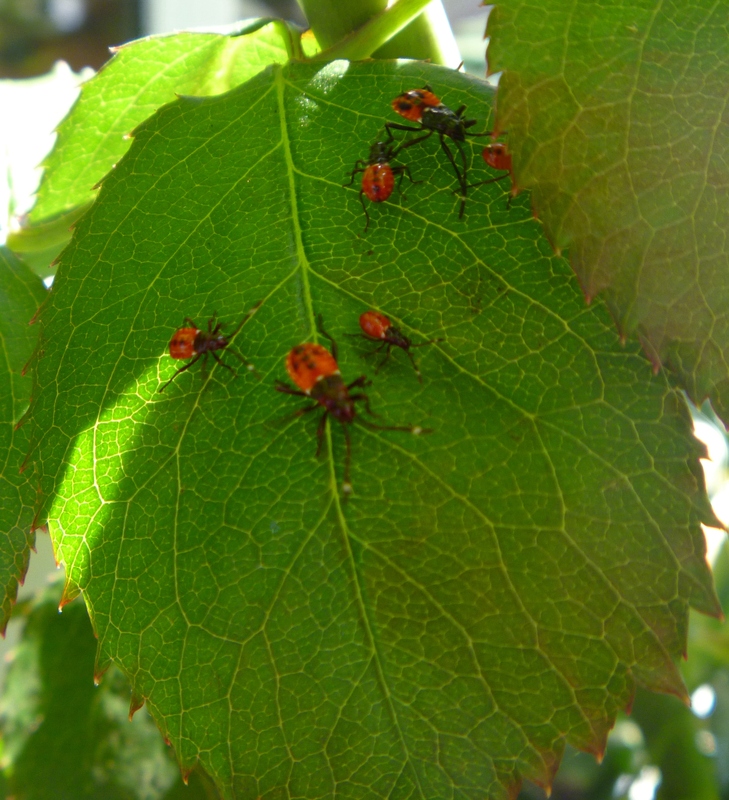 We have battled these bugs since moving to the Bellarine, detergent spray in one hand and the chainsaw to cull most of our native hibiscus in the other. Rampantly defoliated in summer – at one point we resorted to a systemic spray in a vain attempt to regain control -the one tree we kept has bounced back through winter to again provide the perfect combination of refuge and food source for these garden villains. In hot weather we found them sheltering under the leaf litter created by the extensive defoliation, under nearby pots and at the base of any fencing in shady spots. Tidying up and removing pots and anything else they can shelter under seemed to make a difference – have your dishwash spray ready or a bucket of soapy water to knock or brush them off into. Getting them early in the season when they first appear – ours have already well and truly started – when they’re still slow from cold and in early morning when they’re still clustered on your paling fence, is the best bet. I’ve wondered about traps – maybe there’s something in this sheltering behaviour we can exploit – has anyone tried this? Have been trying hard to find the name of this bug. Finally came across your site with the info I was after. This bug has shown up in my gardens a year ago (in Tarneit). Never had them for the first 3 years living in this area, now they move along to each plant in my garden. They always start with the strawberries, if I am able to kill them off from there, the next day they will be at tomatoes, if I remove them from there they move onto the next plant. I noticed in spring they were hiding/hibernating in my Yukka leaves I have in the front of my house. I found another blog about with similar stories to this one. No natural predator, not even chickens will go next to them. I had a slate insect problem originally, but it seems as soon as they disappeared, these guys took over. Possibly moved them out? Hi Daniel and thanks for dropping by 🙂 Thankfully I haven’t had much of a problem (so far) with these bugs this season, but it is possibly only because I’m only growing a couple of veges this year. My native hibiscus has also gone which was one of their favourite hiding spots and I’m starting to wonder how important to them it is to have an ideal host/hibernation plant…by the sounds of things it is probably just as well that I don’t have a Yukka! Thanks for the advice on the dishwashing liquid. We live in Swan Hill and I am a first time veggie gardener. I have noticed them around my capsicum seedlings but didn’t take too much notice because I was concentrating on the plague proportion earwigs the previous month. Like you said, I looked at them, and their babies, more with curiosity than alarm but one of my tomato seedlings went from hero to zero within one week recently and I put it down to the earwigs or something else. Today the harlequin bugs were all over the seedling in its death throes so I decided to do some investigating and they were also around some other tomato seedlings and especially around the capsicum bed which is now almost bare. Have started spraying with your recipe and will tackle them with the zest I applied to the earwigs. 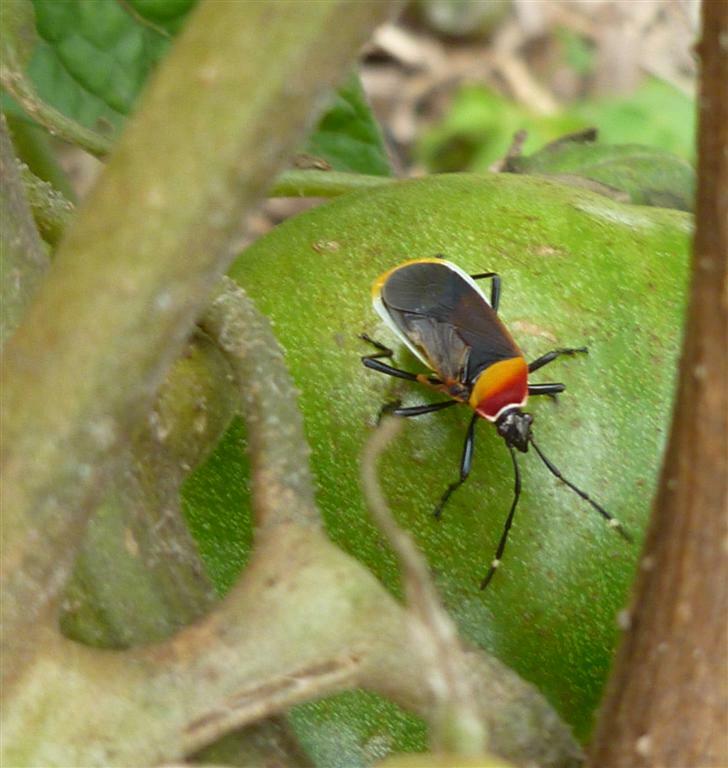 Thanks for this post been trying to find out what these bugs were called as im gardening illiterate mostly and having just started a vegie garden these things were everywhere. i tried planting flowers herbs etc to bring in some predators but no luck. Will be spraying my garden tonight when it cools down and hope for the best. Thanks for a great introduction (and fantastic quality photographs!). 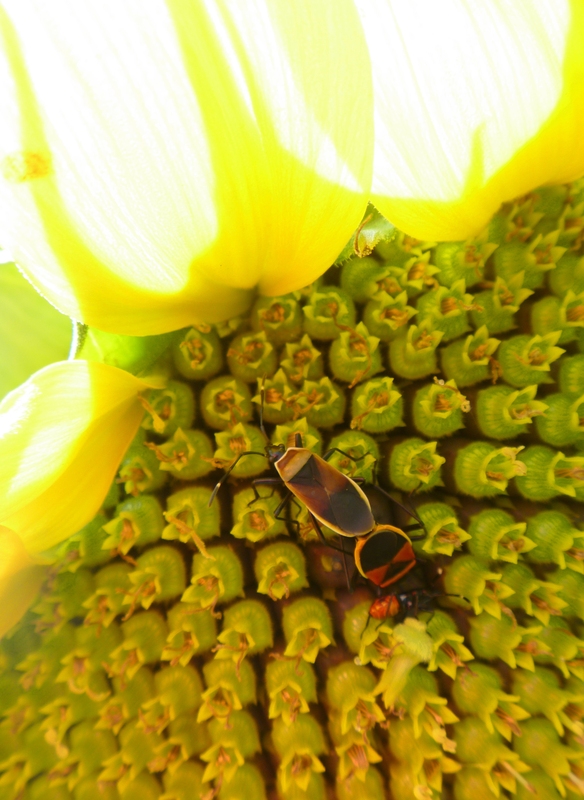 For ages I didn’t pay much attention to the harlequin bug outbreaks; but knowing they were a sap-sucker I did wonder about transmitting disease and so on. They have been very bad this year. Maybe it’s the wet summer weather we’ve had. So after finding your blog I looked up any scientific papers that seemed relevant. I’ll post these notes at http://astherivergoesby.tumblr.com if anyone wants to look for links to references. Control of mallow/hibiscus species (like the weeds that commonly grow in my lawn here in Bacchus Marsh) seems sensible, based on a paper from Latrobe University, published in the Australian Journal of Ecology in 1981. The study found that while the bugs may feed on many plants, and also carrion and are cannibals, they start the year principally in Malvaceae (mallow, hibiscus). The native hollyhock Malva Preissiana (previously called Lavatera Plebeia) is apparently their main native host plant. As the summer progresses and the mallows go to seed, the bugs then opportunistically move to other convenient plants. So I’d hypothesise that if the mallow weeds are controlled well in early spring, the outbreaks of the bug could be reduced later on. I’ll test this hypothesis next Spring! It will mean a bit of a dilemma for what to do with the beautiful native hollyhock growing in my front garden – it was the most beautiful floral display this spring just gone! The other possibility for control is perhaps in their dormant stage. They apparently overwinter under bark or in leaf litter and mulch, so depending on how your garden is set up, you may be able to reduce their refuges. Certainly, getting rid of mulch from your vegie garden in winter can reduce slug and snail populations, and lets the sun warm the soil, so it’s not a bad idea (if it rains a lot, your soil may get compacted though). For those wondering about predators, one record I could find was from the CSIRO journal Emu (“Austral Ornithology”), in 1911, which in a survey of the contents of birds’ guts/gizzards, found a D. versicolor in the gut of a fan-tailed cuckoo (Cacomantis flabelliformis). This bird (according to my bird guide) is usually found in closed forests from cape york south, and across SE Australia. Whether you can get it in your garden, and whether it will eat many of the bugs, I have no idea! Thanks Ben, it was very interesting reading the additional information you found. This year is the first year in many that I haven’t noticed them…yet. But my native hibiscus is gone as are the hollyhocks. Plus I have moved my vege patch to where the duck can supervise bugs and maybe she has a taste for them after all. Good luck with your own efforts to control the little horrors! Thanks everyone for dropping by. I’m afraid I’m not keeping a close eye on the blog at the moment and won’t be able to reply to comments for the time being at least. But I hope the information here continues to be of help! I have these in my garden and I’ve noticed that their instars (young ones before they start mating) will over winter on certain plants. These are usually Malva (marsh mallow and hollyhock), tomatoes that we’ve been a bit slack and not removed and I noticed them (but to a lesser extent) on docks. Once I started removing any of these weeds (and old tomato plants) I noticed that their numbers suddenly crashed and have been less of a problem. Like you, I haven’t noticed anything eating them (except the odd spider) and the chooks avoid them like the plague.